Picking up your puppy is probably the most exciting part about puppy raising, but as soon as all the cuteness has warn off (actually some of the cuteness will wear off the first time he piddles in the house or perhaps a little poopie accident on the car ride home…YUCK!) one of the first things you will think about is how to potty train your puppy. When we first started raising guide dog puppies over ten years ago we received a guide dog puppy manual on how to train a puppy. As guide dog puppy raisers we follow all the rules and puppy training guidelines outlined in our puppy manual and when it comes to potty training our puppy we simply turn to page 42 in our manual and follow the instructions on how to potty train a puppy. So today we’re going to discuss how we go about…you guessed it…potty training a puppy! QUICK TIP: You likely don’t have access to a Guide Dog Puppy Manual. Luckily we’ve read many books on puppy training and one of our favorites, Puppies for Dummies is an easy read that will give you a solid foundation for raising and training your puppy. 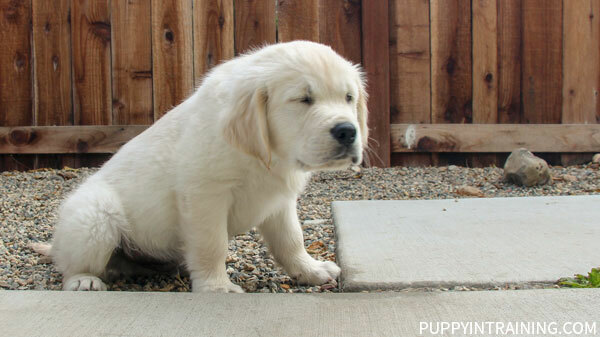 Here are some of the basics we’ve learned over the years on how to potty train a puppy. Potty training is obviously one of the first things you’ll want to teach your puppy. If done properly, potty training is not difficult. The key is to be consistent. Never allow YOUR puppy to be unattended or out of YOUR sight. If you are unable to do this remember to use confinement as a means of prevention. QUICK TIP: We highly recommend crate training your puppy as a primary means of confinement. We’ve been using the Midwest Life Stages Double Door Crate w/ Divider since we brought home our first puppy, Linus over 13 years ago. Using a designated area in your yard, let your pup have plenty of time (fifteen minutes) to relieve itself. Encourage the puppy to go by using words such as “Get Busy”. This is the command used at Guide Dogs of America. We use the same command with all for our puppies in training. This is uber important. 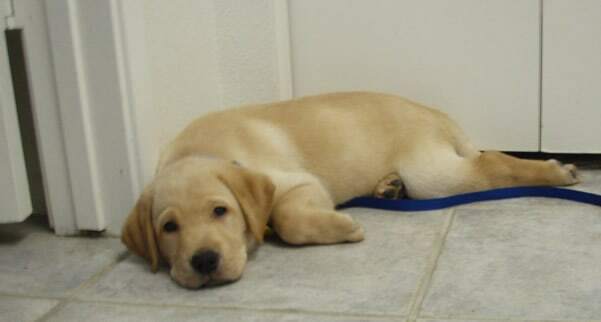 Anticipating when your puppy will potty should be something you know like the back of your hand. Right before you and your pup retire for the night. Many of these potty training tips are from our guide dog puppy manual and don’t need to be followed to a “T” if you’re training your puppy as a family pet. One thing I wish I would have known sooner is to train my puppies to relieve on different surfaces. My rescue pup, Linus learned to pee and poop on the grass and was potty trained in less than two weeks. However, when he was nine months old we took him camping and he would not go potty on the dirt. There was no grass and we were worried that we’d have to drive into town (about an hour away) to find grass for him to pee on. After holding his pee for over 24 hours he finally relieved in the dirt and pee’d for about 2 minutes straight (think Tom Hanks in A League of Their Own). The moral of the story? It’s important to train your pup to pee on a variety of surfaces. All of our guide dog puppies have learned to pee and poop on cement, grass, gravel, rocks, wood chips, dirt, and any other place you might imagine. As soon is Derby was up from his nap it was time for a potty break. One of the great things about being a guide dog puppy raiser is the incredible network of knowledgeable puppy raisers and guide dog trainers we have at our disposal. Some of the members in our Orange County Group have been guide dog puppy raisers for 20+ years and have raised a dozen or more puppies! I guess we’re relative neophytes as Dublin is only our third puppy in training and this is only our fifth year as guide dog puppy raisers. UPDATE: as of today we are entering year 13 as puppy raisers and we’ve raised 11 puppies for multiple service dog organizations. As guide dog puppy raisers we are required to enroll our puppies in a minimum of one puppy kindergarten and one basic dog obedience class. One of the first questions we are asked at puppy kindergarten is how are you doing with potty training your puppy? Even our most experienced puppy raisers will still sometimes have questions on how to potty train a puppy. 1. Keep an eye on your puppy – We learned pretty fast that it’s important to keep a constant eye on your puppy. Use puppy gates (same as baby gates), tie downs, and leashes to make sure you can always see your puppy. If you see him start to sniff around, circle, whimper, or squat then quickly scoop him up and take him out to his designated potty place in the yard. Give him a ton of praise when he potty’s in his spot. It’s important to keep your puppy under constant supervision not only for potty training purposes, but to keep him out of trouble in general. We’ve found many a chewed up shoe, cell phone, remote control because we didn’t keep a close eye on our puppies. This can be both costly and dangerous for your puppy. 2. Keep a puppy potty schedule– If you keep a puppy potty schedule you’ll notice your pup can be fairly predictable with his potty times. We just use a sheet of paper and write down every time our puppy goes pee or poop (you’ll start to notice trends on your puppy’s potty schedule). Here are a few potty times that should automatically be on your schedule. Your puppy will always need to go potty shortly before and after eating or drinking water. We feed our pups twice a day (our young puppies eat three times a day) at specific times which helps control the times they go poop. As soon as your puppy wakes up. Puppies almost always go potty right after waking up. As Linus’s dog trainer used to say: “Play makes pee!” It seems as though every 10 minutes or so your puppy will pee when playing. 3. Be Consistent – stay free from variation. Stay consistent so your puppy knows what you want him to do. Be consistent by taking him out the same door to the same potty spot. Be consistent with your puppy potty schedule. Be consistent with your puppy’s feeding schedule. Be consistent and make sure everyone in your household abides by the same puppy potty training rules. If you do not stay consistent then it will take longer to potty train your puppy. 4. Be Persistent – continue firmly with your potty training your puppy in spite of any difficulty. At times it may seem like your puppy just does not get it, but don’t waver and be persistent. It took our Aussie mix, Linus less than 2 weeks before he was potty trained. It took about 6 months to fully trust Stetson with his potty training. Stay persistent! 5. 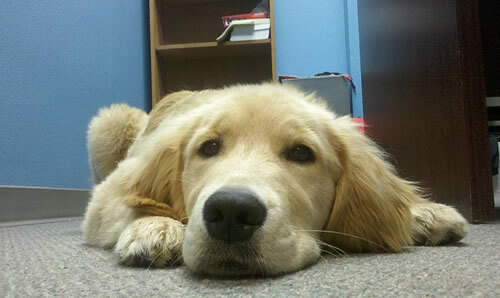 Be Patient – defined as the ability to suppress annoyance…puppies are adorable, but they will also test your patience. Try to remain calm and don’t get upset with your puppy. 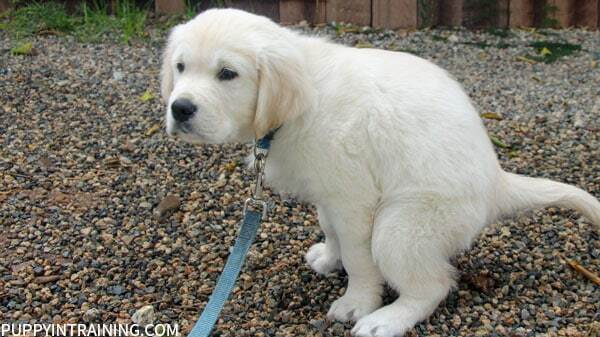 It takes time to potty train a puppy. Be patient and you will be rewarded. If you feel yourself losing your patience step away for a while and let your puppy have some alone time in his crate with his favorite KONG or chew toy. 6. Praise Your Puppy – The most important thing when we raise our guide dog puppies is to give your pup tons of praise every time they do something right. Don’t forget to give your puppy a ton of praise every time he goes potty in his designated potty area. This will help reinforce the behavior with your puppy. Puppy Charlie taking a pee pee brake. Place the crate in your bedroom where the puppy can still see and hear what is going on. Put a blanket or towels in the crate for bedding. A pup will rarely soil the crate, however, if he does, try removing the bedding. A crate should not be too big, but large enough for the puppy to stand, stretch and turn around. When placing the puppy in the crate, use word “kennel” or “kennel up”. If he should happen to fall asleep somewhere else, pick him up and place him inside and quietly shut the door. Don’t use the crate for punishment. Take your puppy outside to potty before putting him in the crate. Take your puppy outside to potty as soon as you take him out of the crate. Puppy In Training TV Episode 2 reviewed several puppy training basics including a short clip on taking your puppy to his potty spot (approximate 2:15 in the clip below). 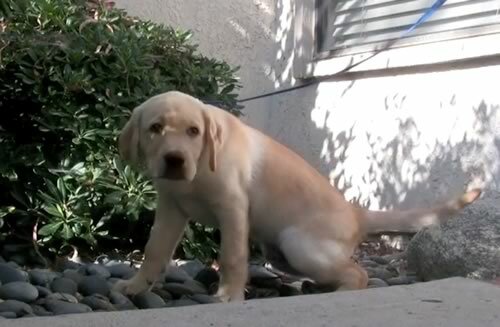 Check out our other Puppy In Training TV episodes. If you’re interested in sponsoring an episode please let us know by sending us an email through our contact form. Do Not Rub Your Puppy’s Nose In His Accidents! We need to reiterate…Do not Rub Your Puppy’s Nose In His Accidents! Do not hit your puppy after an accident! Do not punish your puppy if you find an accident! Never punish your puppy after the fact. Your puppy will think you are punishing him for whatever is happening at the time of the correction. Your puppy will not make the connection that this is an area that he previously soiled and that is why you are punishing. Full Disclosure: When I was in college (Holy Crap! Over 25 years ago!) my roommate had a dog and instructed me to…rub his puppy’s nose in his accidents to teach him not to potty in the house. Guess what, his puppy never connected the dots and continued to have accidents in the house every day the 1+ year I lived with this poor little puppy. If your puppy pees or poops on the floor or carpet make sure you clean it up immediately (I’m sure I really didn’t have to say that). Your puppy’s nose is thousands of times stronger than your nose. If your puppy smells the pee or poop on the floor then he will return to this spot to pee again. In order to remove all the stain and order we like to use an enzyme-based odor remover. Our favorite is the Rocco & Roxie Stain and Odor Remover. Remember your puppy’s nose is thousands of times more powerful than yours make. If he smells a trace of urine then he’ll feel compelled to potty in that spot again so make sure you find a good stain and odor remover. One final note: If your designated potty spot is in a public area (or even at home) make sure you bring potty bags (we like these earth rated bags made from recycled materials) or a pooper scooper to clean up your mess. One of our biggest pet peeves is the person who does not pickup after their puppy. It’s bad for the environment and for some reason the bottom of my shoe seems to always find the dog poop that was left behind. 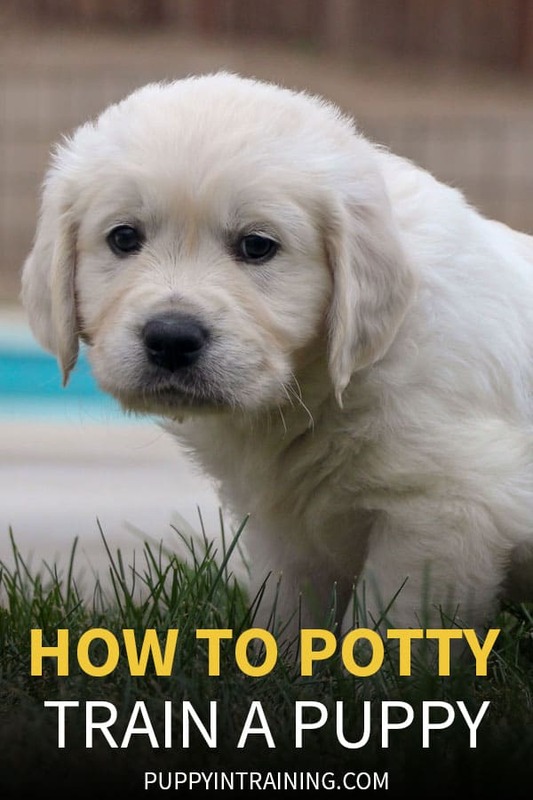 I hope this little guide helps you with your puppy potty training basics. Puppy Management – Keep an eye on your puppy 100% of the time and when you can’t let your puppy have some quiet time in his crate (Midwest Wire Crates are our favorite for crate training puppies). – the fewer accidents your puppy has in the house the sooner he will be potty trained. Clean Messes – Any time your puppy does have an accident clean thoroughly with an enzymatic cleaner like Rocco & Roxie’s Stain and Odor Remover. Puppy Potty Schedule – Get out a piece of paper and start writing down when your puppy sleeps, eats, drinks, plays and goes pee/poop. Keep your puppy on a schedule and you’ll start to notice a pattern. What questions do you have about potty training a puppy? I have a Yorkie puppy and no matter how late I take her out for the last time she will go poop and pee in her crate . I take her out at 6am and she will go poop and pee again. I have try everything? She is fed twice a day 7am and 4pm. Can you please tell me what I am doing wrong She isn’t my first puppy. When you have a moment take a look at our article on puppies peeing in their crate. Do you suggest using potty pads for training? I have a English bulldog and bit bull mix puppy , I feed her twice a day at the same time and walk her immediately after she eats to go potty . She still potty’s on. My carpet after bringing her back in . She has a potty pad , but she only pee’s on it and poops’ in the carpet . I am following your guidelines please help ..
We have a 9 week old labradoodle that doesn’t mind peeing in her crate, there have been several mornings where we wake up – only like 6-7 hours – and she’s covered in pee. Are we supposed to wake up several times in the night to take her out? Honestly we did at first, but if she wasn’t ready right then she would just go back to sleep in the grass or want to play and not go. So we would put her back to bed and would still wake to find her in pee. Suggestions? My puppy is 11th month old, and she use to pee and poop in her potty tray but now she suddenly stop using it, and she never pee and the whole day. I think its 2 days now without a pee. What should I do now? Any advice or suggestions? If this were my puppy I’d take her to see the veterinarian. Great post. When I adopted my pup they told me he was potty trained. That was not the case and soon my apartment paid the price. Apartment living with dogs can be challenging because you want to stimulate and socialize them but sometimes the dog rest area has too much activity for a pup in training. We weathered the training storm so to say. I read lots of blogs, ebooks, and other sources. I am thankful to you for this blog post because there are people out there like me that seek aid with dog training. Keep up the great posts!